My parents’ dog passed away. My parents’ dog Pompe passed away this week, riddled with lymphoma. Naturally, it’s difficult for my parents, who have poured infinite amounts of time and love into the little being for the last seven years. 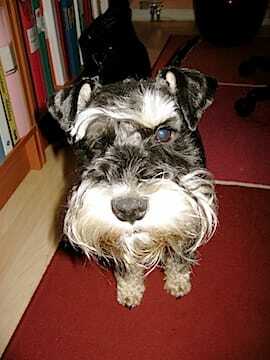 As a true schnauzer, he didn’t show any symptoms until it was much too late for anything to be done. On the last day my dad walked him, he went to the corner, did his business, and then laid down and couldn’t get up, so my dad had to carry him home. After that, it was the vet hospital and death. In a selfish way I’m really upset too, as I was looking forward to walking him when Andrea and I go to Sweden this summer. Pompe and I spent many a happy hour together walking in the woods around my parents’ house. He is missed. Godspeed, little guy.